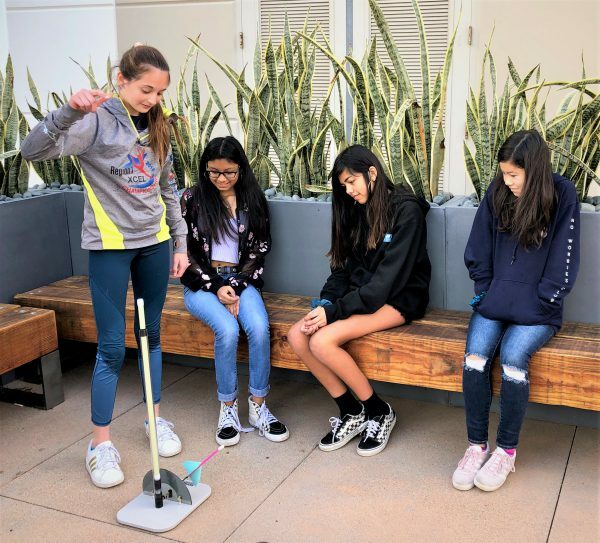 Thurston students prepare to launch a rocket they built at Virgin Orbit on Wednesday. Photo by Amy Orr. Eighth-grader Lauren Trautenberg stepped off the school bus and stood outside the headquarters of Virgin Orbit in Long Beach. Lauren’s mother, Dora Trautenberg, a field trip chaperone, was equally optimistic. “Trips like this are a great opportunity for kids to investigate their interests and learn about possible future careers,” Dora said. Thurston Middle School’s seventh- and eighth-graders spent Tuesday and Wednesday touring different workplace sites. These visits, which are part of Thurston’s Passion Project program, are designed to give youngsters insight into the paths they may want to follow as adults. This is the second year that Thurston has offered this opportunity. Principal Jenny Salberg said that the program started in response to LCAP results. The field trips are offered to all students without cost because of the generosity of groups like the PTA and School Power, Salberg explained. Students visit a variety of business locations that target various personality traits and interests. The six sites selected this year represent the six different Holland code categories: artistic, conventional, enterprising, investigative, realistic, social. Thurston Student Support Specialist Asley Blum explained the process. On Tuesday, buses took youngsters to Sony Studios (artistic category), Angel Stadium (realistic category), and the Vans/Oakley Headquarters (enterprising category). On Wednesday, students visited Virgin Orbit (investigative category), Finance Park (conventional category), and the Village of Hope/the Giving Farm (social category). “These trips are a neat opportunity for kids to explore grown-up life,” chaperone Frank Mead said. “It’s amazing that our school does stuff like this to help us find our careers,” seventh-grader Jude Young commented. Jude’s question about calculating rocket trajectories was answered with enthusiasm by a Virgin Orbit tour guide. In fact, the VO engineers hesitated to show one of their video presentations because they were so impressed by the number of thoughtful Thurston inquiries. Students asked about the positive and negative aspects of 3-D printing, as well as the need for counterweights to address the imbalance of a rocket sitting on one side of a plane. Virgin Orbit’s Mission Design Engineer Alex Poveda deftly handled the youngsters’ technical questions, but he also talked about his company’s wide range of jobs.